The crucial Cameroon 2019 nations cup qualifier between Nigeria and South Africa holds today and we got all to need to know about the encounter just for you. After starting poorly with a 2-0 home loss to the Bafana Bafana, the Super Eagles picked themselves up to win the subsequent three games to now top the group. South Africa, who started brightly with that win against Nigeria - their first in a competitive match against the Super Eagles - have slightly faltered by the way with two draws and a win. They new find themselves a point below Nigeria, but with a crucial home game advantage. This game will go a long way to determine who wins the group and is also an issue of bragging right. South Africa, based on the outcome of the encounter in Calabar will want to prove that win was not an exception - but that the team have grown and are no longer in the shadows of Nigeria. Nigeria will want to prove the opposite - that the loss in the first game was a mere anomaly which will be be instantly rectified to status quo. South Africa are without several first team players due to injury, but their coach has insisted that won't stop the team from their goal of beating Nigeria. Nigeria also will be without first choice goalkeeper, Uzoho who is out through injury and Leicester's Ndidi (suspension). 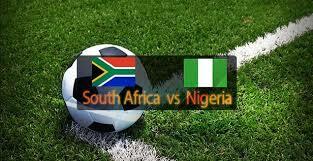 Venue: FNB Stadium, South Africa.